Three versions of the typewriter shown here are known: the International, the International 5 and the New American no 5. In fact, the three machines are identical. They are also very similar to the Odell typewriter, using the same printing mechanism and the same linear index. The relationship between the manufacturers is clarified in the article on the Odell 5. 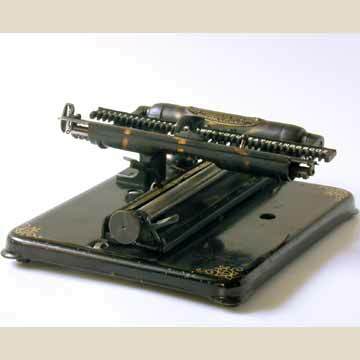 The New American Type Writer Company that produced this Odell clone with the square sheet metal base, also produced a machine called the America Type Writer, that had the same cast iron base as the Odell. That machine was a renamed version of the rare Odell 5 that was for sale as late as 1906. Production of the International seems to have started in 1906 or 1907. A French ad for the New American was found in a 1907 magazine. According to Ernst Martin, France in particular was an important export market for the International 5, where it was said to have been sold as the American 5. Picture 6 however, shows the name plates of the International and the American. It is interesting to see that the patent information on both machines is given in French, indicating that the machine was exported to France. The International was a cheaper version of the Odell, using a cheap rectangular base with pinstripes in stead of the elaborately decorated round base of the Odell. Decoration on the International was limited to stripes of copper plating on the blue steel mechanism.